Wide shot of the Harry Carey Ranch in Saugus, located at the mouth of San Francisquito Canyon Road (just north of today's Copper Hill Drive). Apparently shot from a point near the trading post on the east side of San Francisquito Creek. Date unknown, but prior to the March 1928 failure of the St. Francis Dam and the resulting flood, which cut through much of the property seen here (and wiped out the trading post). 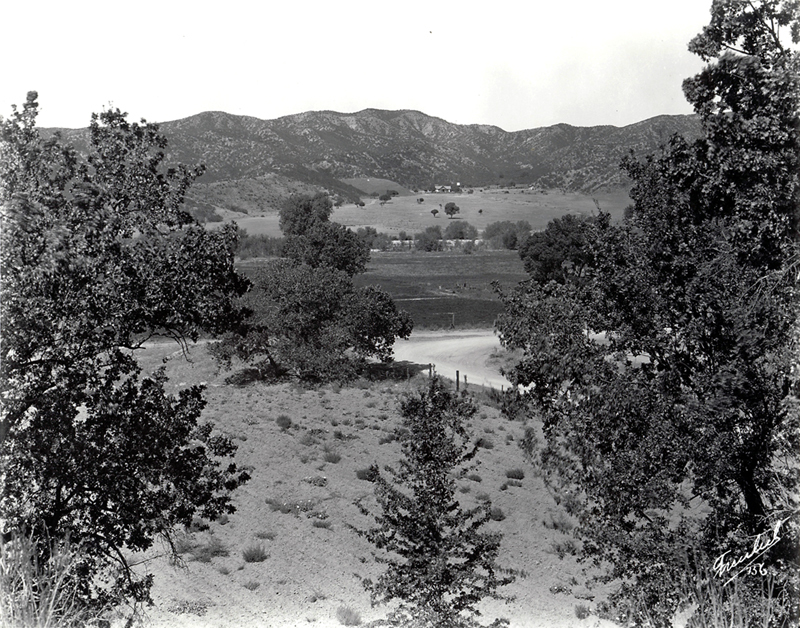 The original wooden Carey ranch home is seen across the creek in the distance. It was on high enough ground to survive the flood, but it burned down in 1932 and was replaced with an adobe ranch-style home that became the centerpiece of the eventual Tesoro Adobe Historic Park in the Tesoro Del Valle subdivision. DC2203: 9600 dpi jpeg from original print courtesy of Harry Carey Jr.